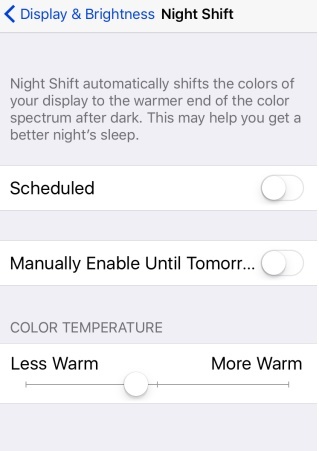 Home > iOS > How To Enable, Customize Tint Intensity, And Schedule Night Shift in iOS ? iOS 9.3 brings with it a feature called night shift, where you can customize the brightness and warmth of your screen backlight. There is an application named Flux that could also customize the screen brightness and warmth of the screen. However, the app needed tweaking of the internal system which is why Apple banned it. Now this new Night Shift in iOS can automatically shift the color brightness to the warmer side of the color spectrum. The hue and warmth is adjusted to give a soothing effect to the eyes and help you sleep better. 1. To access this feature, first go to Settings pp. Now go to Display & Brightness and tap Night Shift. You will find the color temperature slider bar. Move the slider to left or right to adjust the color brightness according to your comfort level. 2. You can also make Night Shift to turn on or off automatically. To do this, turn on the Schedule option. Now set the turn on or off time as per your requirement. The Automatic Schedule comprises of three options, Sunset to Sunrise, Custom Schedule and Time schedule. 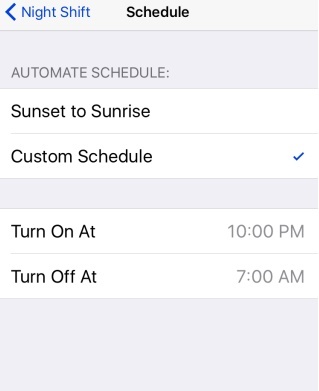 For Sunset to Sunrise, the feature will turn on after sunset and turn off after sunrise. The other two features are customizable according to your preferences.